The solution to the single test issue for grammar schools is as clear as it is simple: how defensible is the practice of using two tests to determine grammar school entry? In what follows, I argue, on behalf of test-takers that “dualling” is unlikely to be defensible. 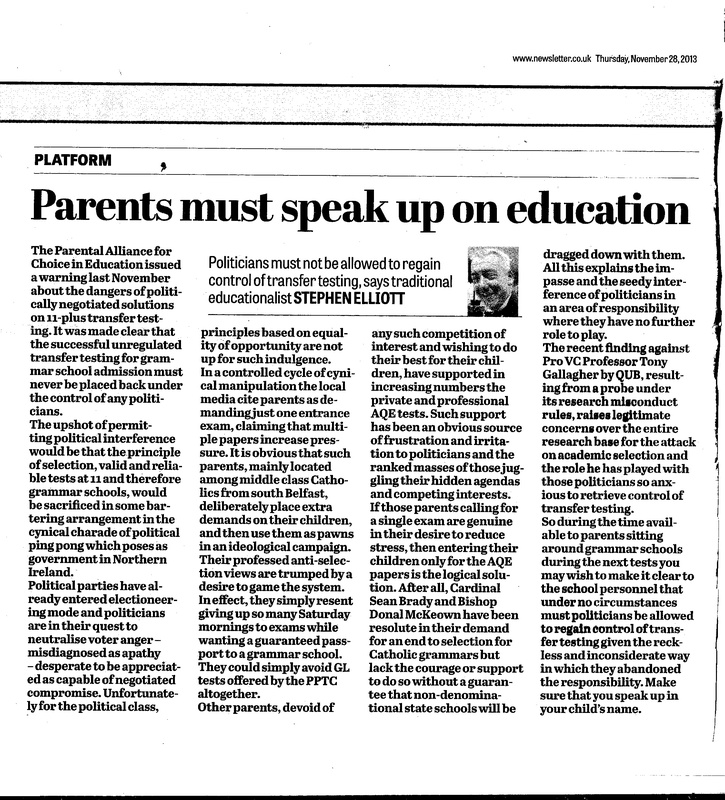 Given the recent entry of the Presbyterian Church in Ballymena into this debate, it will be useful to frame the case that “dualling” is unlikely to be defensible using the Church’s concern that testing only adds to the “stress already inherent in moving from primary to post-primary school.” My central preoccupation will be the radically differing approaches to test anxiety taken by the AQE and GL tests. 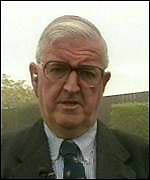 The Transfer Test, abolished by Direct Rule ministers and Sinn Fein when that Party took up the education portfolio, consisted of two tests, each of one hour duration, taken on separate days and assessing mathematics, English and science. Children, who might, for example, have had a sleepless night before taking Transfer Test 1, had the opportunity to improve their score on the second test. In these circumstances, a sleepless night might only impact adversely on one of the two assessments. Moreover, by holding the tests on different days, children, through access to their teachers in the period between tests, had opportunities to address shortcomings in their knowledge and skills which might have come to light in Transfer Test 1, in time for Transfer Test 2. I will now argue that while the AQE test, by design, seeks to reduce levels of test anxiety below those associated with the Transfer Test, the GL test represents a backward step in addressing test anxiety when compared with the Transfer Test. GL’s guidance literature reveals that children are involved in almost two hours of testing (with a comfort break in the middle) at one sitting. (It should be noted no GCSE examination – taken by much older pupils – exceeds 90 minutes.) In the GL framework there is no opportunity to address shortcomings between test occasions because the assessment in its entirety takes place on one day. A sleepless night has the potential to impact adversely on all aspects of the child’s test performance. Added to this, the children have to carefully transfer each of their answers to a multiple-choice grid because the GL test is marked by “optical mark recognition” software. While the GL test has greater potential for stress and anxiety than its predecessor, the AQE test was designed to improve on the Transfer Test in this respect. The AQE test involves three one hour tests and seeks to improve on the Transfer Test’s two-test structure in respect of test anxiety. 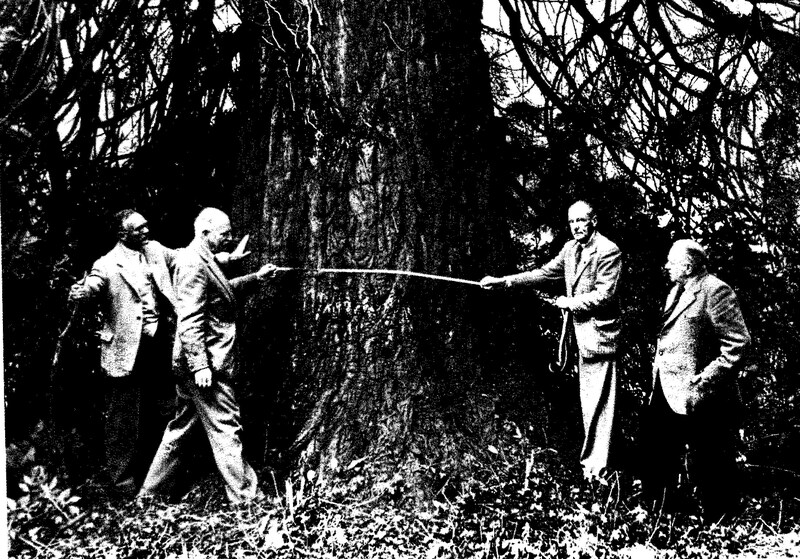 The first and second tests are separated by a fortnight, and test three is taken one week after test two. There is plenty of opportunity to address misconceptions with one’s teacher as one goes from test to test. The impact of a sleepless night is greatly reduced because the child’s best scores on two of the three tests are used to compute his or her published score. The process discards the child’s lowest score. Finally, children simply write their answers (and rough work) on the test paper, with the need to transfer each answer to a grid obviated entirely. Why should it matter that one test (GL) has decreased the number of test occasions previously available under the Transfer Test, while the other (AQE) has moved to increase this number? Why has AQE gone to such lengths to reduce the potential for test anxiety to levels below those associated with the Transfer Test? If it is accepted that the AQE and GL tests differ significantly in respect of their approach to test anxiety, what implication could this have for the practice of “dualling”? The answer is that differences in respect of test anxiety have significant measurement implications. Even for older test-takers, there is a well-established correlation (on a scale from -1 to +1) of approximately -0.4 between test score and test anxiety (see Wildemuth (1977): Test anxiety: An extensive bibliography (ERIC/TM Rep. 64). Princeton, NJ: Educational Testing Service). Questions about the defensibility of “dualling” arise because the two tests used to assign children to a single rank order, measure differently as a consequence of their differing approach to test anxiety. 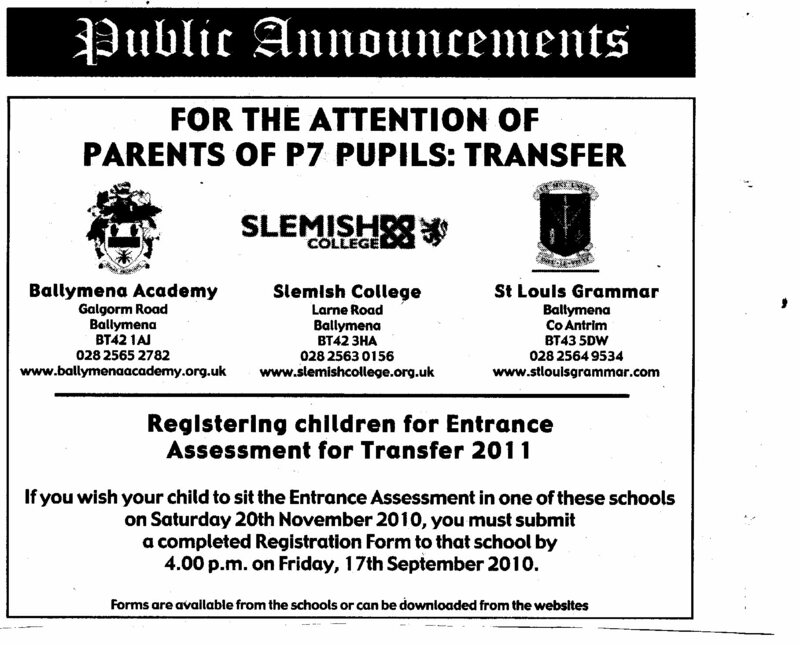 The Ballymena Presbytery is right to emphasise the centrality of minimising pupil stress. This has been at the heart of the AQE project since its inception. Any effective “dualling” algorithm must take account of the differing approaches of the AQE and GL assessments to test anxiety. Because no such algorithm exists, “dualling” can play no role in attempts to address the concerns raised by the Presbytery. 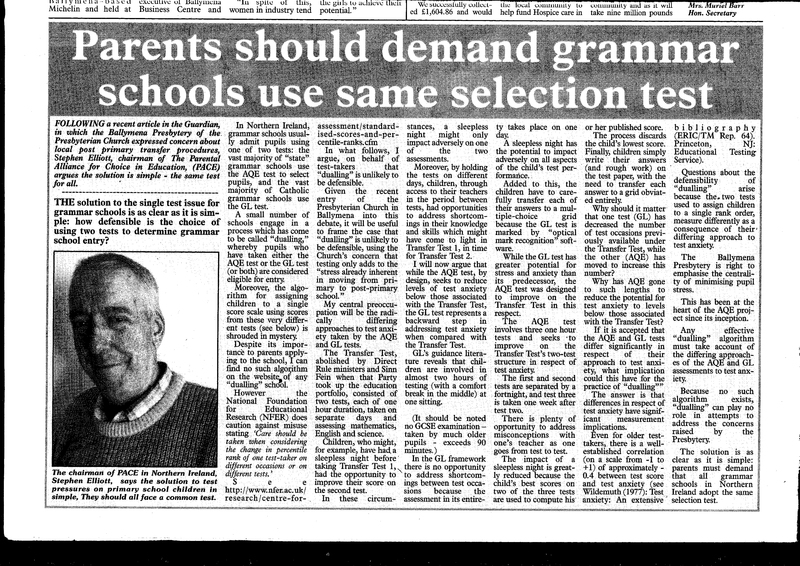 The solution is as clear as it is simple: parents must demand that all grammar schools in Northern Ireland adopt the same selection test. The Code of Practice on Access to Government Information is a non-statutory scheme which requires Government Departments and other public authorities to release information in response to specific requests. The Act creates a statutory right of access, provides for a more extensive scheme for making information publicly available and covers a range of public authorities including schools and colleges.
. The legislation http://www.opsi.gov.uk/ACTS/acts2000/en/ukpgaen_20000036_en_1 allows 20 working days for a reply to issue. The response can include information such as directing the queries to other sources, issuing a partial answer, citing legal exemptions to the request for information. No such rely was received. Bangor Grammar School has now joined the company of other schools who seem to have failed to have learned the lessons given by their Education and Library Board’s FOI officer on their duties and responsibilities. 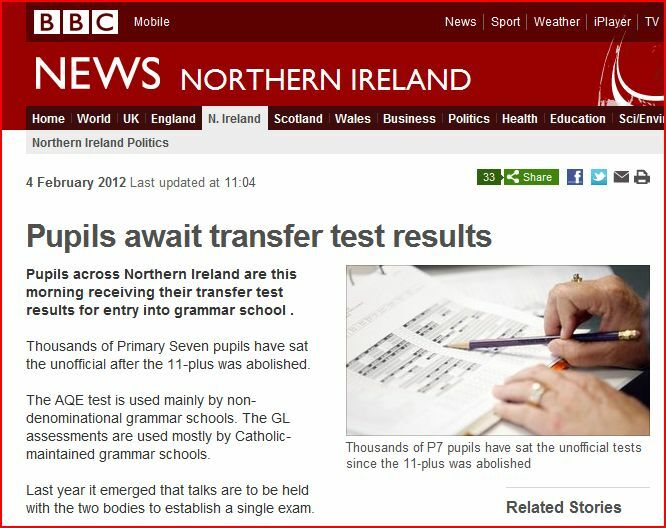 This disturbing information is made public to parents to take into consideration when seeking information about how the results of transfer tests such as the AQE Common Entrance Assessment or GL Assessment are to be used to determine admission to a grammar school. It may be helpful for parents to familiarise themselves with the admission criteria to Bangor Grammar School. Given the school’s choice of the AQE CEA test ( a rank ordered approach) as the instrument to determine admission, the citation of the Minister’s Free School Meal criteria seems to indicate that two horses are being ridden. 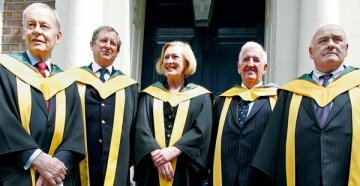 To sum up: the School seeks to give due consideration to the constituents who have traditionally been part of the community which the School has served and which it reflects in its ethos; it also wishes to give weight to the Minister’s desire that schools should seek to restore the imbalance in access to post-primary provision caused by social disadvantage. To achieve this in its practice and procedures, the Board of Governors has decided that there should come a point in the selection process when pure academic ability as measured by a score in the AQE CEA as the sole criterion should be balanced against wider considerations. It has therefore resolved that, in principle, up to 90% of its admissions number should be determined by rank order in the AQE CEA and that the remaining 10% should be allocated primarily by means of the non-academic criteria. Its choice of 90% is determined by the pattern of admission over the last three years, 2007 to 2009, when, on average, 92% of its intake was composed of pupils who had achieved a grade A or B in the Transfer process. The remaining 8% was typically drawn from pupils who had achieved a C1, of whom there were more than there were places available within the admissions number and to whom, therefore, the non-academic criteria were applied. To broadly replicate the position which obtained within the model of selection offered by the Transfer procedure up to and including 2009 and to sustain, therefore, continuity of process, the Board proposes to create a ‘pool’ of applicants drawn from the next pupils in strict rank order after the first 90% have been placed, the size of which is calculated as twice the number of places available and which will be approximately equivalent to the C1 band. Restricting the pool to this number will be more likely to ensure that all will be academically competent, while at the same time giving priority to socially disadvantaged pupils and acknowledging the School’s sense of community as represented by those groups listed in the non-academic criteria. Perhaps instead of giving weight to the Minister’s desire the Principal should concentrate in compliance with the law. 15. This enables an applicant who is not satisfied with the response by a public authority to a request for information to apply to the Commissioner for a decision on whether the authority has acted in accordance with the provisions of the Act. Subject to certain conditions, for example, the exhaustion of other means of complaint, the Commissioner is under a duty to reach a decision.